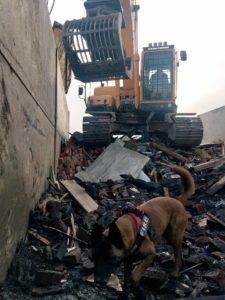 We recently caught up with Mat Dixon who is a Fire Investigation Dog Handler for West Midlands Fire Service. Mat works alongside his fury colleague Kai. 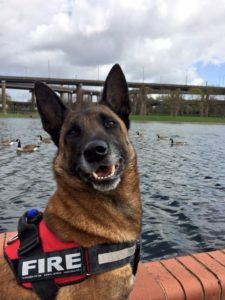 Kai is a 6 year old Belgian Shepherd Malinois and has been with Mat and the fire service since they adopted him from a rescue centre as a puppy. ‘He is conditioned to detect flammable liquids such as petrol, lighter fluid, paraffin etc, used in the setting of deliberate fires. Once we have extinguished the fire Kai can be put to work. He searches the scene for traces of flammable liquid left behind, these traces are often so minuscule that the human nose cannot detect them.’ Explains Mat. 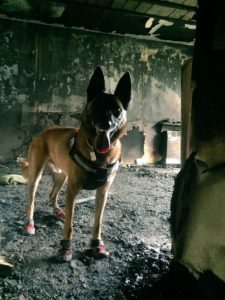 Kai wears a harness and protective boots to keep him safe while he searches, and, if necessary can work on a long search line. By locating these traces Kai can help to work out if the fire was set deliberately and help to identify the arsonist. 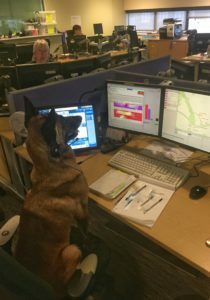 ‘As with the Police Dogs, Kai lives at home with me and my family, enjoying all the privileges of a pet dog, he’s a working dog, but to him, work is play, so I’ve not heard him complain yet.’ Says Mat. ‘This can happen at any time, day or night, but is usually just as tea is being dished up, the football is about to kick off, or I’ve just put my running gear on. We respond to these jobs on blue lights, never knowing exactly what we will be dealing with when we arrive. It may be a small bin fire, a house fire or a huge factory, you never know. In addition to this we may find ourselves carrying out a school or care home visit, or giving a demonstration to the Police, other Fire Service or the local WI.’ Adds Mat. ‘This is a tricky one, there are only about 15 of us in the whole of the UK, so, openings are few and far between. 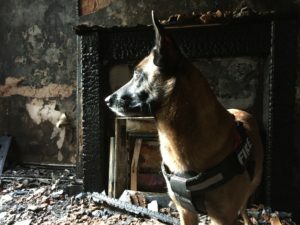 In short, and in most instances, become a Firefighter, become a specialist Fire Investigation Officer, wait for the current dog handler to retire. A huge thank you to Mat, Kai and the wider team at West Midlands Fire Service for taking the time to speak to us.